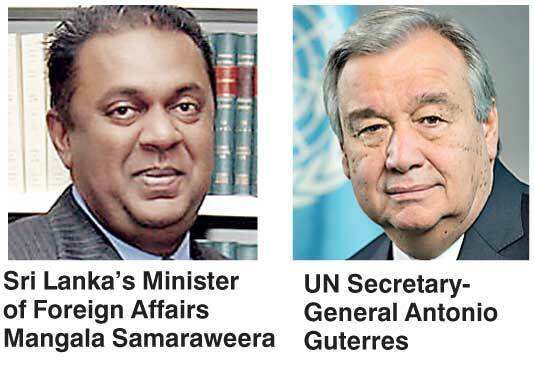 The Unity Government, welcoming the pledge delivered by the new Secretary-General of the United Nations António Guterres on his first day at the helm for global peace in 2017, has expressed its own commitment to achieve peace and reconciliation in Sri Lanka. United Nations Secretary-General António Guterres, who officially began his five-year term today, after being sworn in on 12 December, pledged to make 2017 a year for peace. “On this New Year’s Day, I ask all of you to join me in making one shared New Year’s resolution: Let us resolve to put peace first,” said Guterres, in an appeal for peace. Welcoming the new Secretary-General and committing to continue working closely with the UN, Sri Lanka’s Minister of Foreign Affairs Mangala Samaraweera emphasised the relevance of the Secretary-General’s message for a shared New Year’s resolution “to put peace first”, for the entire world community, and for Sri Lanka. He stressed the commitment of the National Unity Government, under the leadership of President Maithripala Sirisena and Prime Minister Ranil Wickremesinghe, to move forward on the path of reconciliation and achieving a durable peace. Guterres took the oath of office on 12 December following the Assembly’s tribute to outgoing Secretary-General Ban Ki-moon, who steps down after leading the global organisation for the past 10 years. In his first official message, the Secretary-General made a global appeal for peace in 2017. Having been formally appointed by the UN General Assembly on 13 October 2016, Guterres, aged 67, will serve for a five-year period from today to 31 December 2021. He was Prime Minister of Portugal from 1995 to 2002, and the UN High Commissioner for Refugees from June 2005 to December 2015.